A spectacular refurbishment of luxury country house hotel Hammet House, Pembrokeshire, has used Broadleaf's stunning Dark Brushed & Burned Oak flooring throughout the ground floor. 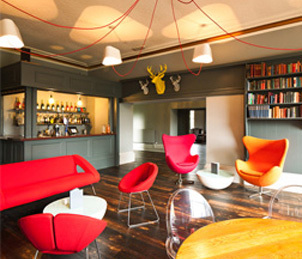 This historic Georgian property, located on the Pembrokeshire Ceredigion border, has undergone a total transformation, with the beautiful Brushed & Burned boards providing the perfect platform to highlight the modern design classics throughout the bar, drawing room & dining room. A stunning designer Vintage Parquet floor has also been fitted in the ballroom and a bespoke variation of Broadleaf Dark Oak marries the period architecture and contemporary furnishings of the refurbished bedrooms. Philippa Gale says "We are absoloutely bowled over by how well the new floors sit within the house. We chose Broadleaf's Brushed & Burned Oak as it was as close to the surviving bits of original floors here as we could find, most of which had been ripped out. People coming in to the hotel usually think the flooring is original, and are amazed when we tell them it has been newly laid. It provides the perfect link between the Georgian architecture of the house & the contemporary interior design scheme and it is also great to know that all the wood has been responsibly sourced & locally manufactured here in Wales".